I love Mexican food, in fact it just might be my favorite food. 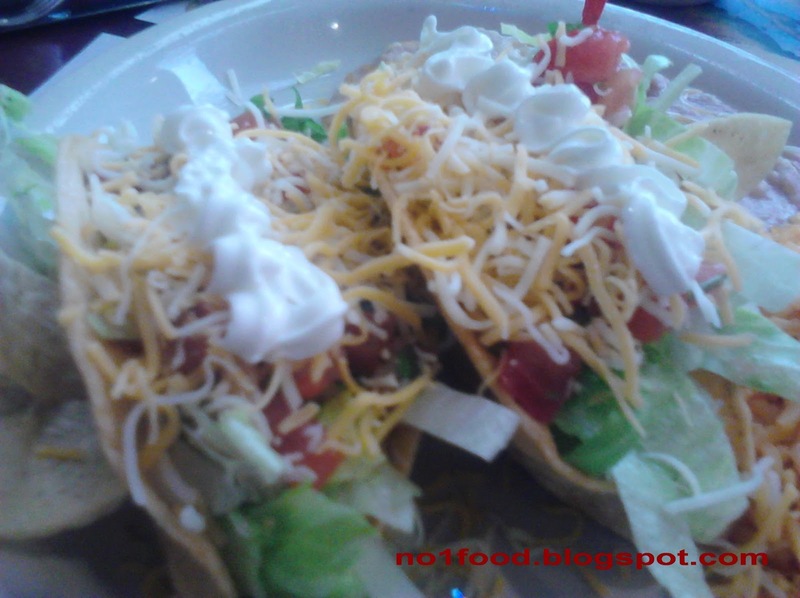 Really good Mexican food restaurants are very hard to find. There are a couple you might call little hole in the wall places here in my town that do have great Chicken tacos. ( my fav) I came across this recipe on the web, however I have found that some of the recipes posted on blogs actually look way better than they taste, and they don't always come out as pictured . But to me, this recipe made sense and the tacos looked so good I had to try it. Got just one word to describe these tacos, AMAZING! medium-high heat. Add the chicken and cook for a couple of minutes. Dump in the diced green chilies. Stir and cook until chicken is totally done inside. Turn off heat and set aside. 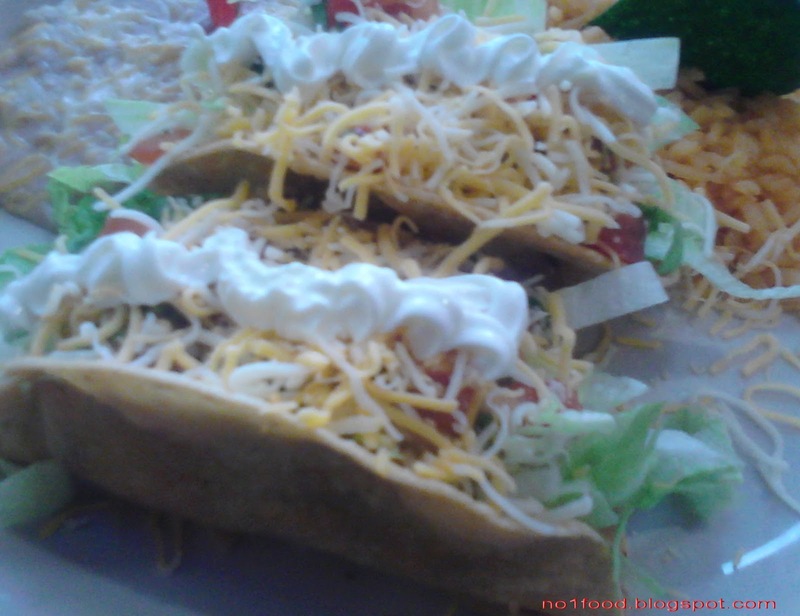 Have all other ingredients—grated cheese, sliced lettuce, diced tomato, sour cream, and hot sauce—ready. One at a time, remove tacos from the pan with tongs, holding sideways as you remove them to allow oil to drip out of the sides. Place the taco in the stack of paper towels. Fold the sides and corners around the taco to tightly hold it, then give it three or four shakes to remove excess oil. Remove it from the paper towels and place on a plate. Repeat with other tacos in the pan. As you continue frying the other tacos, have someone carefully place some grated cheese inside the tops of the tacos (gently pry them open just enough to place the cheese in). Then just let them sit until ready to serve—the cheese will melt as it sits in the warm taco. To serve, garnish in this order: a smear of sour cream, dashes of hot sauce, shredded lettuce, diced tomato. 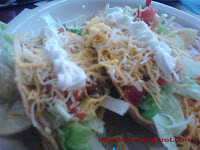 You’ll need to slightly open up the tops of the tacos to get all the garnishes in there. Tacos will be hot for a minute or two after frying, so don’t rush into eating! They’ll stay nice and warm for a little while after frying. Hi, found you at Jody's blog hop. Nice site. Mexican food is one of my family's favorite. Those look yummy! Especially when you're on a new diet and they are so forbidden :( Thanks so much Deanna for stopping by my blog earlier and following... am following you back now. Have a great week! Thank you for linking up with Fun Friday Blog Hop, I am following you now, come follow me back when you get the chance, if you haven't yet! Thank you for joining us for Let's Get Social Sunday :) newest fan. Enjoy your weekend! I like the soft tacos but this sounds very good. I might try it. New follower from the BSN blog hop. You can find me at http://icreatepurtythangs.blogspot.com. Those look delicious. I seriously love tacos and to make them with chicken sounds amazing to me. Love all your recipes- I could learn alot from you because I am seirously the worst cook ever. Just found your blog and have enjoyed getting to know you better. Hope you don't mind if I follow along!